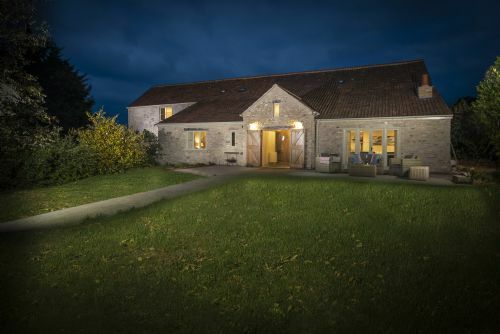 Jack's Barn has comfortable accommodation for 10 people in 5 bedrooms. There is plenty of private space outside and private parking. 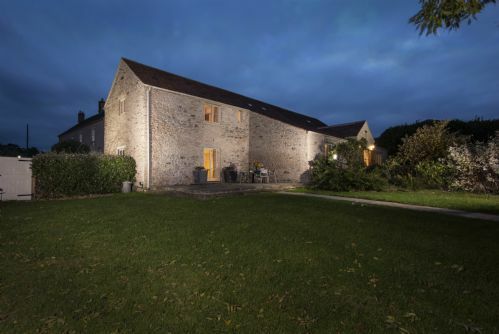 It is the biggest of 3 cottages at Lilycombe Farm, which has a 15 metre indoor heated swimming pool, cinema and games room. There are lovely pub walks within this Area of Outstanding Natural Beauty. The cathedral city of Wells is 10 minutes by car, Bath 30 minutes. Good pubs and restaurants and lots to do. Our extended family of 10 (+ baby) stayed at Jack’s barn to celebrate my father’s 70th - we loved that the interiors were stunning and well thought out, barn was well equipped and surrounded by a beautiful and peaceful landscape. No expense was spared with the facilities with 2 dishwashers, power showers in all bathrooms and beds that were so comfortable - a few of us had commented how soundly we had slept in spite of being in a new environment. The pièce de résistance was the large indoor pool - lovely to have a dip in and always set at a nice temperature, with 2 nicely sized shower rooms and plenty of pool seating around to lounge in - we were in the pool nearly everyday with the kids! Last but not least, we were especially fond of Flora, the new puppy on the block and the affectionate cat, both of whom came to visit and play with the children. The hosts, Jane and Richard, were very approachable and always happy to help or give advice on places to visit or eat. Thanks for a brilliant stay and for helping us to make such special memories! Lilycombe farm is a beautiful place, great for families with kids. The owners are very friendly and warm. Well decorated home, with everything one needs. The only tiny "but"is the cleanliness of the pool side (some dead flies, spider etc on the ground), but than again; it is a farm, so I suppose that's part of the deal. It would be even more perfect if the place had a sauna as well. All and all it's a place to go back to, to relax and enjoy life. It's impossible not to when you're there. We had a wonderful stay at the start of January - lovely, spacious and stylish house; fab pool & cinema room; excellent location with lots to do nearby yet also peaceful; and friendly & helpful hosts. We hope to be back! Thank you.